Save the date for the next great event in Baja Sur as the 26th Anniversary Festival de Artes will be held at the “Hotel Palmas de Cortez” in Los Barriles, from 10:00 am to 4:00 pm on Sunday, March 17, 2019. 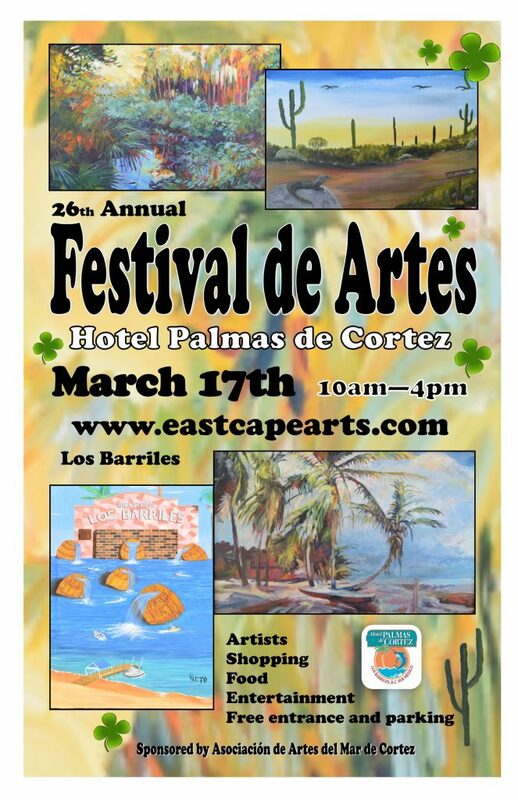 Entering their 2nd quarter century and the most extensive day time celebration of St. Patrick’s Day, this event which is sponsored by the Asociación de Artes, is known as the premier showcase for Baja Sur artists to display and sell their original art and designs. Browse through the rows of over 80 artisans with original art mediums such as oil, acrylic, water color, fabric, pottery, wood and glass. Enjoy the creations of other artists with fabric, flowers, silver, gold and precious stones in designs like no other. We strive to ensure that our artists design and create their original works so that you know you are getting an original hand-crafted piece directly from artist to you! You will also find the vendors with the traditional Mexican items and a selection of booth with the charter fishing, horseback ride, boat excursions, SUP rentals, quads and more – the activity folks! The smells coming from the Food Court will tantalize you with the famous Palmas Carne Asada Taco Stand, hamburgers from San Antiono Gourmet Pizza and Burgers, Sausage Girls out of La Paz and Carmens Café, to name a few. The ice will be crackling with all your favorite cold beverages from our bar that is second to none! And maybe we can even find some good green beer in honor of St. Patrick’s!!! While you are taking a break with your food and cold drink, you will be entertained with traditional folkloric Mexican dancing from the Elementary, Secondary and High Schools here in Los Barriles and San Bartolo schools. We will also be honored to have the folkloric dancers from La Paz Cultural Ministry coming to entertain us with traditional Mexican dancing. The entertainment will be every hour starting at 10:30. We will also be treated with some soothing sounds from the talents of our own local residents. That is entertainment from 10:30 to 4pm. This entry was posted in Art, Art and Culture, Event, Festivals, Los Cabos on February 13, 2019 by Edgar Ruiz Corazon. 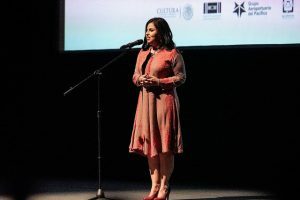 Outstanding personalities from Baja California Sur, Mexico and the world, gathered in the for the opening of the 7th edition of Los Cabos International Film Festival. 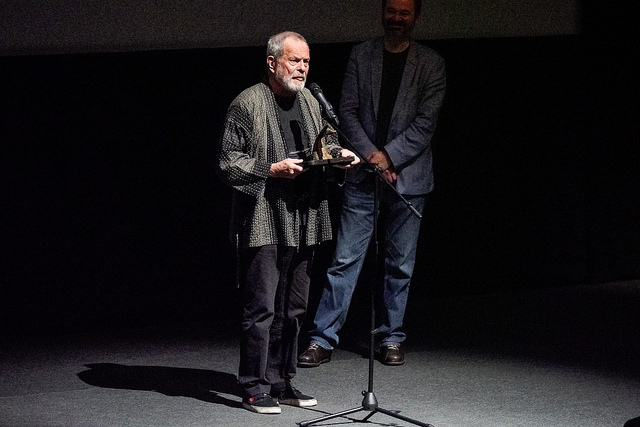 The visionary film director, Terry Gilliam, received the Exceptional Contribution to Cinema History, while the head of Toronto International Film Festival, Piers Handling, obtained the Outstanding Work In Film Industry recognition. The Favourite, directed by Yorgos Lanthimos, starring Emma Stone, marked the beginning of 4 days that will gather the most applauded movies from the entire world. Los Cabos International Film Festival began after a warm day full of welcomes, that ended with the Opening Gala at the Pabellón Cultural de la República, in Cabo San Lucas. The words of Alfonso Pasquel, president of Los Cabos Arte y Cultura A.C.; Jesús Armida Castro Guzmán, municipal mayor of Los Cabos; Carlos Mendoza Davis, Governor of the State of Baja California Sur; Alejandra Paulín, Executive Director; and Maru Garzón, Artistic Director of Los Cabos International Film Festival, invited the audience to enjoy the extraordinary program of films that this event offers, and the attending professionals to explore all the comercial offers that the Industry area of this Festival represents. During the Opening Night Gala, two much expected recognitions were bestowed: the Outstanding Work In Film Industry honor was granted to Piers Handling, CEO of the Toronto International Film Festival; and the visionary, unconventional and irreverent film director, Terry Gilliam, accepted the Exceptional Contribution to the History of Cinema Tribute. The director will also present the Mexican Premiere of his most recent movie, The Man Who Killed Don Quixote, during this edition. For an amazing ending, the audience witnessed the Mexican Premiere of Yorgos Lanthimos’s newest film, The Favourite, winner of the Grand Jury Prize in the Venice Film Festival, starring Emma Stone, Rachel Weisz and Olivia Colman. More than 80 screenings, besides panels, conferences and an Industry market add to a unique personality that distinguish a Festival that contributes to place Mexico as a cultural destination for the world. This entry was posted in Art and Culture, Cabo San Lucas, Los Cabos, Los Cabos Cultural Events, Los Cabos International Film Festival 2018, Los Cabos Social Events, November on November 8, 2018 by Antonio Vargas. Los Cabos International Film Festival will celebrate a memorable 7th edition from the 7th to the 11th of November 2018, with a must-see program comprised of 41 national and international titles, of which 2 are world premieres, 17 are international premieres and 15 are Mexican premieres. The Festival’s industry platform, for its part, will celebrate one of its most ambitious editions to date, receiving over 300 professionals from the international film industry that shall meet over the course of four days at ME Cabo Hotel, to take part in over 400 encounters at the Los Cabos Industry Meetings, screenings and pitching sessions, activities that seek to create a synergy that will allow to continue to build ties between Mexico, the United States and Canada with the rest of the world. The Festival, in partnership with Cinemex, Chemistry, CTT EXP & Rentals, Cinecolor, Talent On The Road /World Talent House, Art Kingdom, Marché Du Film and BOBO Entertainment, will award $6,995,186 MXN distributed among 14 prizes both in the Official Competitions (México Primero and Competencia Los Cabos), and the different financial supports offered by the Gabriel Figueroa Film Fund (Film in development, TV in development and film in postproduction – Work In Progress); added to this is the International Federation of Film Critics (FIPRESCI): Cinematographic Achievement Award. The winners shall be announced on Saturday the 10th of November during the closing ceremony. Pitching Workshop: Producers Paula Vaccaro and Aaron Brookner will host this pitching workshop for the representatives of the selected projects of our TV Series in Development category, who will learn how to strengthen their pitching techniques, and put them to use during the Festival. From Film to TV: The Ups and Downs of A Shifting Industry. This panel will bring together filmmakers, producers and showrunners of some of the most influential series of these last few years. During these meetings, the panelists will discuss the pros and cons of an industry that is constantly gaining more importance as far as their audiovisual content production is concerned. The panel participants will be: Entourage and Ballers (Rob Weiss), Narcos (Andrés Baiz), Alias Grace (Sarah Gadon), Anne with an E (Miranda de Pencier), She’s Gotta Have It (Tonya Lewis Lee), The Bisexual (Desiree Akhavan) Luis Miguel – La serie (Carla González Vargas y Humberto Hinojosa), El Chapo and Señor Ávila (José Manuel Cravioto), Radical Eye: The Life and Times of Tina Modotti (Alex García). The panel will be divided in two sessions, each moderated by the American producer Mark Kassen and the Mexican film critic Arturo Aguilar respectively, and it will take place on November 9, at 11:30 am inside theatre 1 at Cinemex Puerto Paraíso. essays with which they will compete. The winning essay will be published in SensaCine México and The HuffPost México, and its author will be invited to participate in an episode of the radio show El Cine Y…, through Ibero 90.9. The results will be announced during the closing ceremony of our seventh edition. We are also happy to present the Journalists in Cinema and Culture Panel: Conquered territories, that aims to put forward the points of view of women in film journalism, the way they have found their place in the media and an insight on the exercise of their profession. These are the panelists: Hipatia Argüero (Nexos magazine and the winner of our first film critic competition), Adriana Fernández (Reforma), Columba Vértiz (Proceso) and Saraí Campech (Canal Once). The panel will take place on Thursday the 8th of November at 11:45am on the Deck of the ME Cabo Hotel. cycle, in partnership with Casa Dorada. Galas – presented by Resort at Pedregal. As every year, the Pabellón Cultural de la República, will host the red carpet and the opening and closing ceremonies. We are thrilled to announce that the opening ceremony will be followed by the Latin- American premiere of The Favourite (Dir. Yorgos Lanthimos), and as for our closing ceremony, guests will enjoy the screening of Blackkklansman (Dir. Spike Lee), whose Latin- American premiere will also take place at Los Cabos. The Festival is honored by the presence of those prominent figures to whom it will pay tribute this year at Los Cabos, and celebrate their place in cinema history, together with our attendees. Outstanding Work at Film Industry: Piers Handling. We are happy to deliver this award to Piers Handling, executive director of the Toronto International Film Festival for 23 years. Leonardo García Tsao, the renowned Mexican film critic, will lead a dialogue with Piers Handling. Exceptional Contribution to Cinema History Tribute: Terry Gilliam. During the opening ceremony, the Festival will honor the screenwriter, director, actor and comedian, Terry Gilliam, who through his legendary films, such as Monty Python and the Holy Grail (1975), Brazil (1985) and 12 Monkeys (1995) has influenced entire generations and has left his mark in cinema History. Films: As part of this tribute, Terry Gilliam will present The Man Who Killed Don Quixote (2018) and Fear and Loathing In Las Vegas (1998). Dialogue with Terry Gilliam: The celebrated journalist and playwright Juan Villoro, will lead a dialogue with Terry Gilliam, an in-depth conversation about his career, his sources of inspiration and his projects. Exceptional Contribution to Cinema History Tribute: Spike Lee. The Festival is honored to pay tribute to Spike Lee for being one of the most important voices in contemporary cinema, for his strong career and the way in which it has had an effect and inspired other filmmakers, as well as society as a whole, by making it question the status quo. Not only did Spike Lee’s work revolutionize film art during the second half of the twentieth century; its relevance is compelling and its message, to this day, is more pressing than ever. Films: As part of this tribute, Spike Lee will present his most recent film Blackkklansman (2018), and the iconic Do The Right Thing (1989). Dialogue with Spike Lee: the American actor and legendary film partner of Spike Lee, Roger Guenveur Smith, will lead this dialogue. This talk aims to paint a complete picture of Spike Lee’s career, as well as an introduction to his filmmaking process. Outstanding Work In Cinema: Adam Driver. The Festival extends a warm welcome to Adam Driver, an actor not to be missed due to his impressive career in cinema worldwide, and who has worked beside great filmmakers such as Martin Scorsese, Jim Jarmusch, Steven Soderbergh, Spike Lee and Terry Gilliam, amongst others. Films: As part of this tribute, Adam Driver will present a special screening of Paterson (2016), as well as playing the main characters in Blackkklansman and The Man Who Killed Don Quixote. Cine en la playa (Cinema at the beach). We celebrate our partnership with Casa Dorada, by announcing the timetables for Cine en la Playa, held at the hotel on the 8th and 9th of November. The shows are free of charge and all that is needed is to contact the hotel’s conciergerie to make a reservation for these magical screenings. Las niñas bien (Dir. Alejandra Márquez) in the presence of renowned author Guadalupe Loaeza. Free screenings at Cinemex San José del Cabo. The Festival will offer free screenings at Cinemex San José del Cabo, to express our gratitude towards the community that, each year, endorses this event. These screenings will take place on Saturday the 10th of November and Sunday the 11th of November during the Festival. Films that prompt further reflection and invite us to meditate on our personal responsibility as inhabitants of a world that we share with others. One of our most successful film programs, American Specials comprises each year, international and American outstanding films that shine both for their subject matter and directing style, and for their powerful execution that have often catapulted their directors and actors into the spotlight during the award season. This program offers a selection of the most inspiring voices from the present international film scene. The festival is proud to present, for the first time in Mexico, the greatly anticipated premieres of these international films. and Casa Dorada Cabo Real. After a thorough evaluation of the successful call for entries, Los Cabos International Film Festival presents its selection of 14 feature films which are part of the two competitive sections: Mexico Primero and Los Cabos Competition. These films will compete to win $1,166,000 MXN in prizes. México Primero welcomes both novel and bold filmmakers, and more experienced ones who bring forward strong projects that span from intimate storylines to universal tales. The five films selected to compete in this segment range from indie chamber dramas, thrillers, and the study of the labyrinthine human psyche, to stories tinted with history, magic and sensory exploration. Competencia Los Cabos combines an eclectic and vibrant film selection, produced or coproduced by Mexico, the United States and Canada. It brings to Los Cabos, aesthetically strong films with powerful narratives that have received great praise in the other international forums in which they have been a part of, prior to their Mexican premiere, during the Festival’s 7th edition. After a two year absence, one of the festival’s most popular parallel sections makes its big comeback: Afterdark is a platform for films that explore the universe of terror and sci-fi; extreme narratives, alternative realities and immersive universes that awaken and exploit our fear of the unknown. This is the list of our homegrown talent that shall attend our gala evenings: Darío Yazbek, Tenoch Huerta, Ilse Salas, Benny Ibarra, Celina del Villar, Miguel Rodarte, Sandra Echeverría, Pedro de Tavira, Leonardo de Lozanne, Rebecca Jones, Aida López, Antonio Gaona, Stephanie Cayo, Vanessa Restrepo, Guadalupe Loaeza, Christopher von Uckermann and Christian Tappan. The ceremonies of our 7th edition will be hosted by Julio Bracho and Linda Cruz. Presenters and friends of the Festival. Los Cabos International Film Festival is made possible thanks to the support of federal and local authorities: the Ministry of Tourism, the Promotion Tourism Board of Mexico, Los Cabos Tourism Board, the Department of Culture, the Mexican Institute of Cinematography, the State Government of Baja California Sur, the Ministry of Tourism, Economy and Sustainability, and the Municipal Presidency of Los Cabos. None of this would be possible without the accommodations and high quality services offered by local hotels for the filmmakers and artists who travel to Los Cabos to attend the Festival; this is why we wish to thank the Hotel ME, the Hotel Dreams, the Hotel Secrets, The Resort At Pedregal, Holiday Inn Express and Solaz Resort, as well as the hotel Casa del Mar, which hosts our press conferences. We also would like to thank Questro Resorts and the hotels Casa Dorada, Casa del Mar, El Ganzo, Pueblo Bonito, Solmar, Montage, JW Marriott, Bahía, Sheraton Grand, Médano Suites, City Express and Comfort Inn Suites. Thank you to the hotels that host our official events such as Hacienda Beach, Viceroy and 1 Hotel. Thank you to Cinemex, CTT, Chemistry, Cinecolor, FIPRESCI, Talent on the Road, Art Kingdom and BOBO, for your invaluable support in awarding the prizes to the winners of the Gabriel Figueroa Film Fund and the Official Competitions. To the 138 sponsors that render possible this seventh edition: thank you. We wish to thank the 100 plus media outlets that support us through their coverage, both of the event itself and of the exceptional Los Cabos experience. $6,995,186 Mexican pesos will be awarded to the winners, distributed throughout the 15 prizes of the Official Competition and the Gabriel Figueroa Film Fund. Feature films produced by or coproduced with Mexico, United States and/or Canada. Los Cabos Competition Prize : $300,000.00 MXN (three hundred thousand Mexican pesos) in cash for the producer. Feature films produced by or coproduced with Mexico. Cinemex Mexico Primero Prize: $300,000.00 MXN (three hundred thousand Mexican pesos) in cash for the director. International Federation of Film Critics (FIPRESCI): Cinematographic Achievement Award. Trailer Art Kingdom Prize worth $14,000 USD (fourteen thousand US dollars). It includes creative process, production and postproduction services for the trailer of the wining Mexican film. All the Mexican films that will take part in Los Cabos Competition and in México Primero are elegible for the Cinemex Audience Prize that consists of $300,000.00 MXN (three hundred thousand Mexican pesos) in cash for the producer. Feature films produced by or coproduced with Mexico, United States or Canada with any other country in the world. Los Cabos Film in development prize: $100,000.00 MXN (one hundred thousand Mexican pesos) in cash. CTT EXP & Rentals Prize: $813,067.00 MXN (eight hundred and thirteen thousand and sixty-seven Mexican pesos) for four weeks of film equipment rentals (camera and lenses). Talent On The Road/ World Talent House Prize: $150,000.00 MXN (one hundred and fifty thousand Mexican pesos) in cash. The Grand Prize Plataforma CTT EXP & Rentals + CHEMISTRY : $1,283,911.00 MXN (one million two hundred and eighty-three thousand nine hundred and eleven Mexican pesos) consisting of 4 weeks of equipment (camera, lenses, mobile unit and power plant) granted by CTT EXP & Rentals, and $1,789,416.00 MXN (one million seven hundred and eighty-nine thousand four hundred and sixteen Mexican pesos) in postproduction services, which include THE conforming online ensamble material, color grading, digital deliverables, insertion of graphics, Quality Check, DCP, Blu Ray, DVD and backup of the film’s master copy, granted by Chemistry, for a Mexican project or a coproduction with Mexico. Marché Du Film – Producers Network: 374 euros for the accreditations of the producer of a film in development project, to take part in the Marché Du Film’s Producers Network, at the 2019 Cannes Festival. Feature films produced by or coproduced with Mexico, in postproduction stages and with a running time greater than 60 minutes. Los Cabos Work in Progress Prize: $100,000.00 MXN (one hundred thousand Mexican pesos) in cash. CHEMISTRY PRIZE: $945,864.00 MXN (nine hundred and forty-five thousand eight hundred and sixty-four Mexican pesos) in postproduction services which include: conforming online ensamble material, color grading, digital deliverables, insertion of graphics, Quality Check, DCP. Cinecolor México Award: MXN $443,700.00 (four hundred and forty-three thousand seven hundred Mexican pesos), equivalent to 100 hours of color grading and a DCP. Fiction or documentary TV series projects, produced by or coproduced with Mexico or any other country in Latin-America. Promo-Trailer Art Kingdom Prize worth $5,000 USD (five thousand US dollars). It includes creative process and postproduction services. This entry was posted in Art, Art and Culture, Cabo San Lucas, Festivals, Los Cabos, Los Cabos Cultural Events, Los Cabos International Film Festival 2018, Movie on November 2, 2018 by Antonio Vargas. El ​Festival Internacional de Cine de Los Cabos​​, único espacio en el continente americano que promueve el diálogo e intercambio cultural y comercial de la industria cinematográfica de Norteamérica con el resto del mundo; busca, con cada edición, deleitar a la audiencia con una programación cautivante, no sólo mediante una ardua curaduría internacional que exhibe algunas de las películas más aplaudidas en el circuito de los festivales más importantes del mundo, sino también con una selección que da voz a las nuevas generaciones de cineastas mexicanos. Por otro lado, la plataforma de Industria del Festival Internacional de Cine de Los Cabos está diseñada para que el cine de México, Estados Unidos y Canadá, cuente con un escaparate que lo proyecte al resto del mundo mediante tres ejes de acción: el ​Fondo Fílmico Gabriel Figueroa (Gabriel Figueroa Film Fund – GFFF), ​​una selección de proyectos de cine y televisión, tanto en etapa de desarrollo como en postproducción, que a través de la vinculación entre las industrias cinematográficas de Norteamérica, busca promover oportunidades de negocio para la realización de dichos proyectos; ​Gabriel Figueroa Meetings​​, encuentros uno a uno entre proyectos de cine y TV participantes,y una selecta delegación de invitados de la industria internacional; y ​Los Cabos Meet Mart, espacio que funciona como un punto de encuentro y centro de negocios para todos los profesionales del cine que participan en el Festival. Algunas de las películas premiadas durante los 6 años de existencia de GFFF, han sido: Tempestad ​(Dir. Tatiana Huezo), película elegida por la AMACC para representar a México en los Óscares 2017; ​Clases de historia (Dir. Marcelino Islas), estrenada en el Festival Internacional de Cine de Tokio 2018; ​Rush Hour (​ Dir. Luciana Kaplan), estrenada en cines en octubre 2018; ​Cómprame un revólver (​ Dir. Julio Hernández Cordón), presentada en la Quincena de Realizadores de Cannes 2018; ​Los adioses (Dir. Natalia Beristain), estrenada en todo México en 2018, con excelentes críticas; ​La caída (​ Dir. David Pablos), película que está siendo producida por la exitosa actriz Karla Souza; ​La camarista ​(Dir. Lila Avilés), estrenada en el Festival de Cine de San Sebastián; ​Bayoneta (Dir. Kyzza Terrazas), esperada película que llegará a los cines este mes, entre otras. 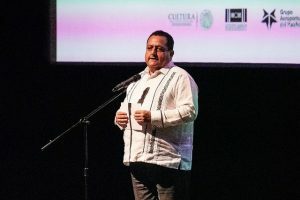 Para fomentar no sólo la realización, sino también la visibilidad de nuevas cintas mexicanas, el Festival mantiene alianzas con instituciones y festivales internacionales como Tribeca Film Institute, Marché du Film de Cannes y Sodec, Telefilm Canadá y el Independent Filmmaker Project NY; quienes, a través del Festival, eligen anualmente nuevos proyectos para darlos a conocer en sus propias plataformas de financiamiento, desarrollo y promoción. ¡Tú puedes contribuir a la realización de una nueva película mexicana! 2o Concurso de Crítica Cinematográfica. Los Cabos +​​, área formativa del Festival anuncia los nombres de los tres participantes que viajarán a nuestra 7a edición para ser asesorados por respetados y reconocidos críticos de cine, que unen esfuerzos para guiar a las frescas voces que escribirán sobre las nuevas cintas del cine mexicano. El Festival se enorgullece en albergar el panel ​Periodistas en el cine y la cultura. Territorios conquistados​​, que contará con la participación de reconocidas profesionales que compartirán sus experiencias y puntos de vista en torno al rol de la mujer en el periodismo profesional. Roma, d​​ e Alfonso Cuarón, llega a #LosCabos7. Roma, la nueva película del director ganador del Óscar, Alfonso Cuarón, llegará a Los Cabos de la mano de nuestra 7a edición para formar parte de nuestras presentaciones especiales. Premiada con el León de Oro a Mejor Película en el Festival de Cine de Venecia 2018 y aclamada por la crítica, ​Roma​, marca el regreso del galardonado director a producir en la república mexicana, y es considera una de las contendientes más fuertes al Óscar a Mejor Película Extranjera 2019. Cine en la playa. ​​Celebramos nuestra colaboración con Casa Dorada, anunciando las funciones de Cine en la Playa que el hotel albergará el jueves 8 y viernes 9 de noviembre. Las funciones son de entrada gratuita y únicamente pedimos al público interesado en asistir a ellas, contactar al área de concierge del hotel para reservar su lugar en estas mágicas proyecciones. Las niñas bien ​​(Dir. Alejandra Márquez) con la presencia de la reconocida escritora Guadalupe Loaeza. Funciones gratuitas en Cinemex San José del Cabo. El Festival presentará proyecciones gratuitas en las salas de Cinemex San José del Cabo, para agradecer a la comunidad que año con año hace suyo este evento. Estas proyecciones se llevarán a cabo el sábado 10 y el domingo 11 de noviembre, en el marco del Festival. Películas que invitan a la reflexión y a meditar sobre nuestra responsabilidad como habitantes de un mundo compartido. Uno de nuestros programas fílmicos más exitosos, año con año ha estado conformado por películas que han destacado en el contexto del cine estadounidense e internacional, no sólo por sus propuestas temáticas y de realización, sino también por las poderosas ejecuciones que muchas veces han colocado a sus realizadores y actores en el foco de la temporada de premios. El programa integrado por una selección de las voces más inspiradoras en el panorama del cine mundial contemporáneo. El Festival se enorgullece al presentar por primera vez en México los esperados estrenos de estas películas provenientes de diversos rincones del mundo. Tras la evaluación de una exitosa convocatoria, el Festival Internacional de Cine de Los Cabos presenta la selección de 14 largometrajes que integran las dos secciones competitivas: México Primero y Competencia Los Cabos. Estas películas competirán por $1,166,000 MXN en premios. México Primero​​, abre las puertas no solo a nóveles y audaces cineastas, sino también a otros cuya experiencia ofrece sólidas propuestas con historias tan íntimas como universales. Las 5 películas de esta selección transitan entre el drama intimista indie, pasando por el suspenso y la exploración de los laberintos de la psique humana, hasta llegar a propuestas teñidas de tradiciones, magia, y exploración sensorial. Competencia Los Cabos, ​​que agrupa una ecléctica y vibrante selección del cine producido o coproducido por México, Estados Unidos y Canadá, lleva a las pantallas de Los Cabos películas con fortalecidos trazos estéticos y narrativos que les han valido también el reconocimiento en los foros internacionales por los que han pasado antes de su estreno en México durante nuestra 7a edición. Después de dos años de ausencia, regresa una de las secciones paralelas más celebradas del festival; en Afterdark damos lugar al cine que explora el terror y el sci fi; narrativas extremas, mundos alternos y universos inmersivos que provocan y explotan nuestro miedo a lo desconocido. El talento nacional que se dará cita en las noches de gala incluye los nombres de: Aida López, Antonio Gaona, Benny Ibarra, Celina del Villar, Dario Yazbek, Fernanda Castillo, Julio Bracho, Leonardo de Lozanne, Linda Cruz, Miguel Rodarte, Paulina Goto, Pedro de Tavira, Rebecca Jones, Sandra Echeverría, Stephanie Cayo, Tenoch Huerta y Vanessa Restrepo, ente otros. Presentadores y aliados del Festival. El Festival agradece la confianza de instituciones federales y locales, cuyo apoyo permite la realización de este evento: Secretaría de Turismo, Consejo de Promoción Turística de México, al Fideicomiso de Turismo de Los Cabos, Secretaría de Cultura, Instituto Mexicano de Cinematografía, Gobierno de Baja California Sur, Secretaría de Turismo Economía y Sustentabilidad, y Presidencia Municipal de Los Cabos. Agradecemos también a Cinemex, al Grupo Aeroportuario del Pacífico, a Grupo GEPP, El Nacho, Lenovo, Condé Nast, Televisa, Monex, Del Cabo Event Design, Mexico Planners, EcobajaTours, Puerto Paraíso por sumarse a nuestros esfuerzos para ampliar el alcance del Festival. Sin el hospedaje y la atención para nuestros invitados, no sería posible lograr que tantos realizadores y talentos se den cita en Los Cabos, por esto, agradecemos a los hoteles que se han vuelto las Casas Oficiales del Festival, como son el Hotel ME, el Hotel Dreams, el Hotel Secrets, The Resort At Pedregal, Holiday Inn Express y Solaz Resort, agradecemos también al hotel Casa del Mar, anfitrión de nuestra conferencia de prensa. Agradecemos también a Questro Resorts, ​Casa Dorada, Hotel El Ganzo, Pueblo Bonito, Solmar, Montage, JW Marriott, Bahía, Sheraton Grand, Médano Suites, City Express y Comfort Inn Suites. Gracias a los hoteles que además albergan nuestros eventos oficiales como son Hacienda Beach, 1 Hotel, y Viceroy. Gracias a Cinemex, CTT, Chemistry, Cinecolor, FIPRESCI, Talent on the Road, Art Kingdom y BOBO, por otorgar los premios de los ganadores del Fondo Fílmico Gabriel Figueroa y las Competencias Oficiales. A los 138 patrocinadores que hacen posible esta séptima edición, muchas gracias. Gracias a los más de 100 medios de comunicación que nos apoyan a través de su cobertura, no sólo del evento, si no también de la experiencia que ofrece visitar Los Cabos. Nos encontramos agradecidos de contar con la colaboración de El Nacho, artista plástico radicado en Los Cabos, quien plasmó en las hermosas estatuillas con las que nuestros ganadores y tributados serán reconocidos, un homenaje a los visitantes marinos más emblemáticos de la región: las ballenas. Se otorga la cantidad de $6,995,186 de pesos repartidos entre 15 premios de Competencia Oficial y Gabriel Figueroa Film Fund. Largometrajes producidos o coproducidos con México, Estados Unidos o Canadá. Premio Competencia Los Cabos​​: $300,000.00 MXN (trescientos mil pesos mexicanos) en efectivo para el productor. Premio Cinemex México Primero​​: $300,000.00 MXN (trescientos mil pesos mexicanos) en efectivo para el director. Premio de la Federación Internacional de la Prensa Cinematográfica (FIPRESCI)​​: Reconocimiento al mérito cinematográfico. Premio Tráiler Art Kingdom ​​con un valor de $14,000 USD (catorce mil dólares). Incluye proceso creativo, producción y servicios de postproducción de un tráiler para la película mexicana ganadora. Todas las películas mexicanas que participan en la Competencia Los Cabos y en México Primero son elegibles para el ​Premio del Público Cinemex que consta de $300,000.00 MXN (trescientos mil pesos mexicanos) en efectivo para el productor. Proyectos de largometraje producidos o coproducidos por México, Estados Unidos o Canadá con cualquier otro país del mundo. Premio Los Cabos Cine en Desarrollo: $100,000.00 MXN (cien mil pesos mexicanos) en efectivo. Premio CTT EXP & Rentals: $813,067.00 MXN (ochocientos trece mil sesenta y siete pesos mexicanos) en renta de equipo cinematográfico para cuatro semanas de filmación (cámara y óptica). Premio Talent On The Road/ World Talent House: $150,000.00 MXN (ciento cincuenta mil pesos mexicanos) en efectivo. Premio Plataforma CTT EXP & Rentals + Chemistry​​: $1,283,911.00 MXN (un millón doscientos ochenta y tres mil novecientos once pesos mexicanos) en renta de equipo cinematográfico para 4 semanas de filmación que incluye cámara, óptica, móvil y planta, otorgado por CTT EXP & Rentals, y $1,789,416.00 MXN (un millón setecientos ochenta y nueve mil cuatrocientos dieciséis pesos mexicanos) en servicios de postproducción que incluyen conformado de la película, corrección de color, entregables digitales, inserción de gráficos, Quality Check, DCP, Blu Ray, DVD y respaldo Máster, otorgado por Chemistry, para un proyecto mexicano o coproducido con México. Marché Du Film – Producers Network: ​​Acreditación de un valor de 374 euros, para el productor de un proyecto de cine en desarrollo, para participar en Producers Network, de Marché Du Film, en el Festival de Cannes 2019. Largometrajes producidos o coproducidos por México, en etapa de postproducción y con una duración final mayor a 60 minutos. Premio Los Cabos Work in Progress:​​ $100,000.00 MXN (cien mil pesos mexicanos) en efectivo. Premio Chemistry: ​​$945,864.00 MXN (novecientos cuarenta y cinco mil ochocientos sesenta y cuatro pesos mexicanos) en servicios de postproducción que incluyen: conformado de la película, corrección de color, entregables digitales, inserción de gráficos, Quality Check y DCP. Premio Cinecolor México​​: $443,700.00 MXN (cuatrocientos cuarenta y tres mil setecientos pesos mexicanos), equivalente a 100 horas de servicios de corrección de color y un DCP. Proyectos de series de televisión, ficción o documental, producidos o co-producidos por México o cualquier otro país de Latinoamérica. Premio Promo Trailer Art Kingdom con valor de $5,000 USD (cinco mil dólares americanos). Incluye proceso creativo y servicios de postproducción. This entry was posted in Art, Art and Culture, Cabo San Lucas, Event, Feature Events, Los Cabos, Los Cabos Cultural Events, Los Cabos International Film Festival 2018, Los Cabos Social Events, Movie on October 24, 2018 by Antonio Vargas. Los Cabos International Film Festival has established itself as a proud ally for dozens of film and TV projects that have participated in the Gabriel Figueroa Film Fund (GFFF) over the years. The GFFF boosts projects in development and postproduction stages, and is a showcase to promote co-productions, distribution and exhibition; therefore, it constitutes a solid option to impulse the Mexican and North American film industry. We are pleased to announce the 21 selected titles that will participate in a bid to receive funding through the following three categories: Gabriel Figueroa Film Fund – Film in Development, Film in Post Production (Work in Progress) and TV Series in Development. These 21 titles were picked out of 535 competing projects that applied for the different categories of this one-of–a-kind Fund, which promotes the creation and completion of new film and TV projects produced or co produced by Mexico, USA, Canada and Latin America. In addition to competing for the nine prizes comprised in the three aforementioned categories, the selected groups will be able to participate in worthwhile meetings with outstanding professionals from the international film industry, in the space provided by the GFFF-Meetings. Feature-length films produced or co-produced by Mexico, USA or Canada in affiliation with any other country are eligible to participate. Los Cabos Film in Development Award: $100,000.00 MXN (one hundred thousand Mexican pesos) cash prize. CTT EXP & Rentals Award: With a value of $813, 067.20 MXN of filming equipment rental for four weeks (camera and optic). Talent On The Road/ World Talent House Award: $150,000.00 MXN (one hundred and fifty thousand Mexican pesos) in cash to film projects in development stage produced by or co-produced with Mexico. CTT EXP & Rentals + Chemistry Platform Award: $1,283,911.20 MXN (one million, two Hundred eighty three thousand, nine hundred eleven Mexican pesos ) worth in film equipment rental for four weeks of shooting (camera, optics, mobile and generator) granted by CTT EXP & Rentals, and $1,789,416.00 MXN (one million, seven hundred eighty nine thousand, four hundred sixteen Mexican pesos) worth of post-production services, such as film conform, color correction, digital deliveries, graphic insertions, Quality Check, DCP, Blue Ray, DVD and Master backup, granted by Chemistry, to a film project produced by or co-produced with Mexico. Feature-length films in post-production stage produced by or co-produced with Mexico, with a minimum final duration of 60 minutes are eligible for submission. Los Cabos Work in Progress Award: $100,000.00 MXN (one hundred thousand Mexican pesos) cash prize. Chemistry Award: $945,864.00 MXN (nine hundred forty-five thousand eight hundred sixty-four Mexican pesos) worth of post-production services: film conform, color correction, digital deliveries, graphic insertions, Quality Check and DCP. Cinecolor México Award: $443,700.00 MXN (four hundred forty three thousand seven hundred Mexican pesos), equivalent to 100 hours of color correction services and one DCP. Proyectos de series de televisión, ficción o documental, producidos o co- producidos por México o cualquier otro país de Latinoamérica. Art Kingdom Promo Trailer Award: 5, 000 USD (five thousand American dollars). Includes creative process and post production services. BOBO Award: $100,000.00 MXN (one hundred thousand Mexican pesos) cash prize. This entry was posted in Art and Culture, Cabo San Lucas, Event, Feature Events, Festivals, Los Cabos, Los Cabos Cultural Events, Los Cabos International Film Festival 2018, November on October 18, 2018 by Antonio Vargas.